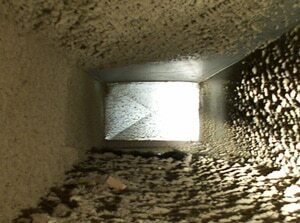 Air duct cleaning goes hand in hand with indoor air quality solutions. In a typical six-room home, up to 40 pounds of dust is created annually through everyday living. Your heating and cooling system is the lungs of your home. The system takes air in and breathes air out. You breathe that air. Most people don’t realize that contaminant buildup in ductwork can also affect the efficiency of your air conditioning system by as much as 25 to 40 % according to the U.S. Department of Energy. So not only will cleaning your ducts make for a cleaner, healthier, and less allergenic environment it will save you money. When Do You Need Air Duct Cleaning? Typically you should have your air conditioning unit checked annually while the supply ductwork, return ductwork, registers, grilles, and diffusers, heat exchangers heating and cooling coils should be inspected once every two years. There could be other conditions in your home that may require air duct cleaning at different intervals. If someone living in the house is suffering from allergies or is experiencing unexplained sickness or a visual inspection of the ductwork shows large signs of dust or mold you may want to consider getting your air ducts cleaned to improve the indoor air quality of your home. Max Mechanical has been serving our customers in Arlington and throughout the DFW area since 1994. If you are looking for a reputable and experienced air duct cleaning company in Arlington, TX then take the next step and contact us at 817-459-4100 or 972-233-1637 for more information about our air duct cleaning services, we’d love to hear from you!